Beware of nuns bearing smiles and words of welcome. That’s what happened to Sam Navarro when he visited his alma matter — but he hasn’t regretted it for a moment. 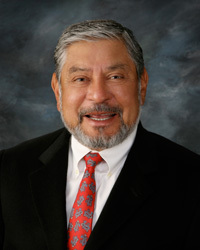 An alumnus of Santa Teresita School in East Los Angeles and Cathedral High School downtown, Sam has been a regular and passionate supporter of Catholic education, as has his wife of 55 years, Yvonne, an alumnus of Santa Teresita and Sacred Heart High School in Lincoln Heights. Whether it’s hosting annual fundraisers at their Pasadena home or donating electrical service to a school in need, Sam is more than happy to contribute what he can for the good of the greater community, an attitude rooted in faith, culture and a solid belief in doing what is right. It was, of course, Sam who dated Yvonne all during high school — she at Sacred Heart, he at Cathedral where he was on the football, track and basketball teams, having been recruited to Cathedral by Christian Brother Bertram Coleman, principal. Influential? Well, there was the day when Sam, then a sophomore, was pulled out of class by Brother Bertram who was concerned about Sam’s involvement with a “social club,” whose dances Sam others would advertise by cruising around with posters on the side of the car. When Sam graduated in June of 1959, he had several out-of-state scholarship offers to play football, but decided not to leave L.A. and instead got married that July 18, began working for his uncle (an electrician), and attended night classes at L.A. Trade Tech. He and Yvonne settled in Alhambra, raising their children Steve and Cynthia at All Souls Church and School (and later sending them to St. Francis and Ramona Convent high schools). After 16 years working for his uncle, Sam founded his own business, Graphic Electric, and set up his office in his garage, where Yvonne handled the phones. The business grew steadily, and today the City of Commerce-based firm, specializing in commercial and industrial wiring, employs 38 people, including son Steve as president and grandson Chase as project manager. A year later, “we heard the school might close and we thought, ‘That can’t happen. This is an oasis in a tough area.’ So we got out the phonebook, called our friends, hosted them on a Sunday afternoon and raised $25,000. And we’ve done it every year since.” The most recent event raised close to $95,000. Over the ensuing years, Sam and Yvonne have served on various boards of their alma maters, supporting the economically-challenged kids who attend them, and the religious communities who administer them. Their children are also active in helping out, much to their parents’ delight. But both Navarros, in fact, do their share of stirring in the name of helping those who need it. “We do what we can,” says Sam. “Part of it is our Hispanic culture, and a lot of these kids at these schools are Hispanic. My dad was a gardener and we didn’t have a lot of money as I was growing up, but our view was, if you have received, you give back in some way. So it’s a no-brainer for us to show our support.